Cloud-native is an approach to building and running applications that fully exploit the advantages of the cloud computing delivery model, namely agility and innovation. 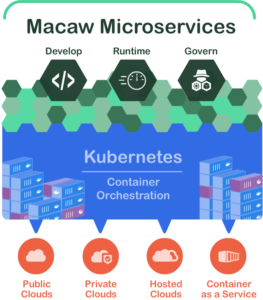 A commonality among these cloud native applications is microservices architecture, containerized services, and distributed management and orchestration. Kubernetes has evolved as the container management and orchestration software of choice, capable of supporting different container technologies (Docker, CoreOS etc) and cloud infrastructures (Public & Private clouds). But to fully address the cloud native needs, enterprises need a layer above it for developing, running and operating Microservices packaged as Containers. This layer should take care of the application level needs, while Kubernetes delivers the services required to run and manage containers. As shown above, building this technology stack involves substantial depth and complexity, hence one of the reasons why we are not witnessing large scale Microservices applications in hybrid cloud environments. To address this problem and smoothen the transition process for enterprises, Macaw has integrated all the required capabilities and is offered as a turn-key platform. With Macaw, enterprises can configure the complete stack at one go and start their cloud native journey. It is programming language agnostic as well as cloud agnostic, completely avoiding technology or cloud lockin. 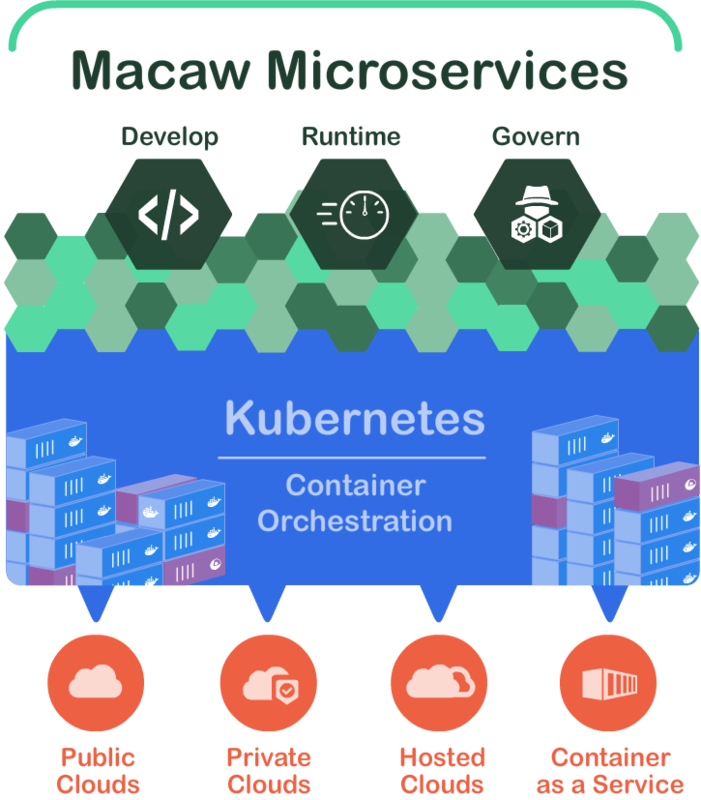 With the latest release, Macaw Platform supports microservice provisioning to environments backed by Kubernetes cluster. Macaw Service provisioner leverages the Kubernetes deployment declaratives to orchestrate the seamless creation and management of service pods. Here are the high level features supported by Macaw platform release 0.9.4 w.r.t Kubernetes environment. The ability to provision Service Blueprints into environments backed by Kubernetes cluster. Macaw Service Provisioner interacts with the Kubernetes master either with basic authentication or token based authentication. Support for Kubernetes virtual clusters (Namespaces). User can create multiple environments in Macaw pointing to the same Kubernetes cluster but different namespaces. Support for multiple instances in a Service cluster. This is achieved seamlessly through the Kubernetes deployment declarative. The ability to view and managed service clusters/pods in Macaw Console. The ability to scale up and scale down a Service cluster. Rolling update of a Service cluster with a new image. Leverage Macaw supported integrations for on-demand container host provisioning required to run Kubernetes clusters in any cloud. Other critical management and governance features from Macaw extended to Kubernetes clusters/pods. Macaw is available as a community edition (along with enterprise edition) so any enterprise can get started without imminent risk or cost. Just visit https://www.macaw.io/ and under the Get Macaw option you can select the one that is most suitable for your enterprise’s needs.